First published December 7, 2018 , last updated April 8, 2019 . Reading time: 5 minutes. Don’t fret about the first appearance of gray hairs – we have a solution for you that promises to be the best hair color to cover gray for brunettes (as well as other hair tones). So, you found your first gray hair. “Weird,” you thought, “I feel like I just entered college not that long ago”, and you shrugged it off. Then you found another one. And that one invited a few very much unsolicited friends. So now at this point you might be despairing, looking at your hair and finding excuses to justify your constant use of headwear to everyone you see or just obsessively plucking the gray strays that you find. But have you thought that the simpler solution for your problem might just be a click away? 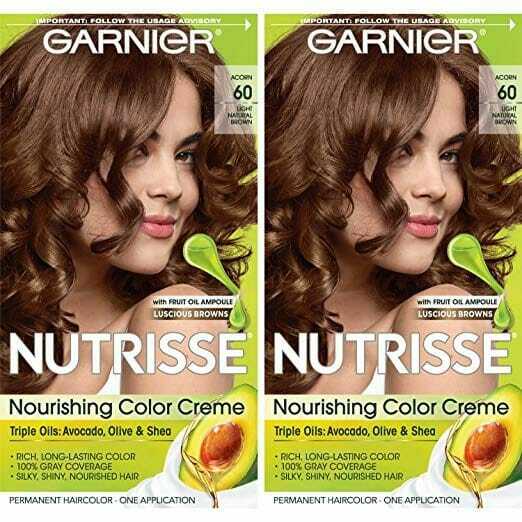 Enter Garnier Hair Color Nutrisse Nourishing Crème, which you can purchase here. This dye, developed by Garnier, focuses on natural-based ingredients. Their products are highly available both on drugstores and online, and offer up to 63 colors. They promise 100 percent coverage for gray hairs, and a nourishing, affordable formula. This highly available and affordable dye is one of the best rated hair color in the market to cover gray hair, from blondes to brunettes and even dark and red hair. Customers praise its gentleness on the hair, and how natural it looks. If you’re worried about it being noticeable – don’t be! According to the reviews, people have been using it for decades when they first started getting greys, and no one has caught on yet! (Clearly a plus if you are concerned about people catching on to your hair changing colors). The best part about this dye is that it protects your hair while it colors, as it is enriched with fruit oils. As most hair dyes can be drying on your hair, that is definitely a plus to consider. However, don’t forget that before you try it in your whole hair, you need to do an allergy test in a small lock of hair. This test should be performed a full 48 hours before you do the full coloring, and is of the utmost importance if you have sensitive skin or scalp. “For the past few months I’ve been coloring my own hair at home. I can’t afford salon quality hair right now yet my hair still looks wonderful and is still healthy,” said an Amazon review. Several of the other reviews echo this costumers. That attests to the product’s effectiveness despite its shortcomings, such as low quantity. 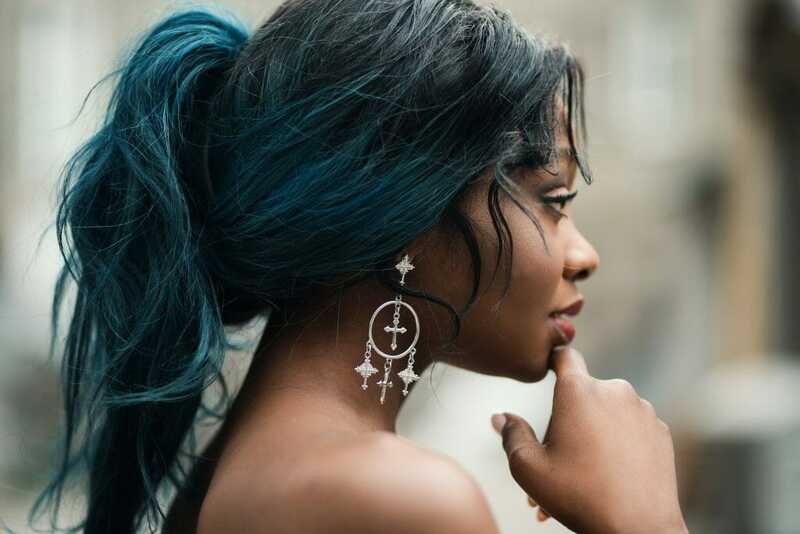 The not so great part about the dye is that, even though it has more nourishing properties than most, it still has the potential to dry out your hair. Even though those complaints are not frequent, they exist, and most stress that the Garnier dye is one of the best they have tried. However, if you’re used to color-protective conditioners and nourishing oils after dyeing hair this might not be deal-breaker for you. Besides the price and ease of acquisition, this dye offers many colors. There’s a wide range of shades, from black to blonde, meaning you can quickly find a match for your hair color. Besides, they offer more than that. If you want to get creative or add a more “out there” highlight, the brand also has offers with blue, purple, red and pink undertones which are certain to make you stand out from the crowd. While most customers say that a bottle is enough for their medium-length hair (approximately past their shoulders), some advise that you get more than one bottle if your hair is longer than that. Mind you that some darker colors can “stretch” but the result may be more patchy or uneven. Our advice is to get more than one bottle – which can be ordered here – and get a good coloring shampoo and conditioner in order to make it last as long as possible, as some of the reviews say that the conditioner that comes with the bottle is too small for their needs. Most customers say that the color can last up to six weeks. That goes for both for the more natural colors and the more vibrant undertone shades. That’s always a plus if you don’t have that much time and only want do reapply to your roots once every few weeks. Always complement your shower routine with a shampoo and conditioner suitable for colored hair. If you use hair styling tools that use heat (such as curling or straightening irons) be even more careful with your hair. Apply a good heat protectant as it can damage and dry your hair. Your hair turning gray is nothing to stress about, even though our initial reaction might always be negative. It is a time to consider our journey up to this point, how far we have grown and how much we have endured. Also, you can rejoice knowing that we have your back, and whenever you need advice regarding your hair. Drop us a comment down below and let us know your thoughts about this hair dye. You’re not sure how to dye your own hair? Jump right here!